As expected, not a huge amount of progress this past week due to the long holiday weekend. Nevertheless, we still made a bit of progress in a couple of areas. Nothing new on the devil prayer front, but we did finish the final two idle animations for Ignatius. Once these are exported and undergo final adjustments, we should be done with all animations for Act 2, and NR can move on once again to the second cutscene and Act 3 while I handle all of the exporting and loading into the game for Act 2. 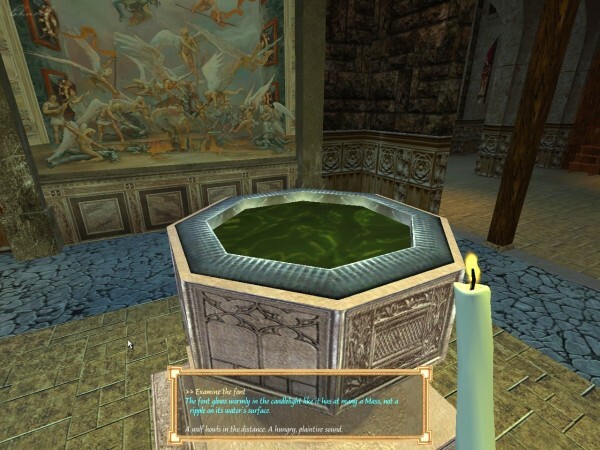 Also, NR solved the issue of animating the holy water in the font using 2-D IFL animations, so we can now have nicely animated holy water for Acts 2 and beyond. Now we just have to figure out what animations are needed. This week’s screenshot shows the temporary font water shape positioned inside the font, with the test animation displayed on its surface. The final shape will use different surface animations. The font water is animated using a smooth 2-D series of images. 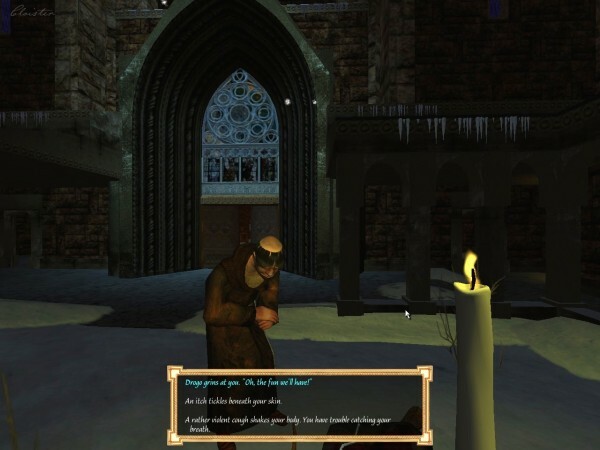 This past week saw us focus primarily on two areas: the final two idle animations for Constantin, and arranging the components of the devil prayer. The idle animations for Constantin required a bit of back and forth with the game to make sure they interacted properly with his bed, but I think they turned out pretty nice. So, as of now, Constantin has six idle animations for Act 2, idleA through idleF, whic hopefully will provide a decent variety of actions. The same actions will apply to Ignatius once NR has those complete, at which point I’ll then focus more on exporting and implementing all of Constantin’s and Ignatius’s Act 2 animations. The devil prayer continues to take shape, with now all eight arms loaded in and positioned correctly. Next comes some experimentation with lighting and particles, which will probably be tricky. However, with a long holiday weekend coming up, I’m not expecting a tremendous amount of progress to report next time. 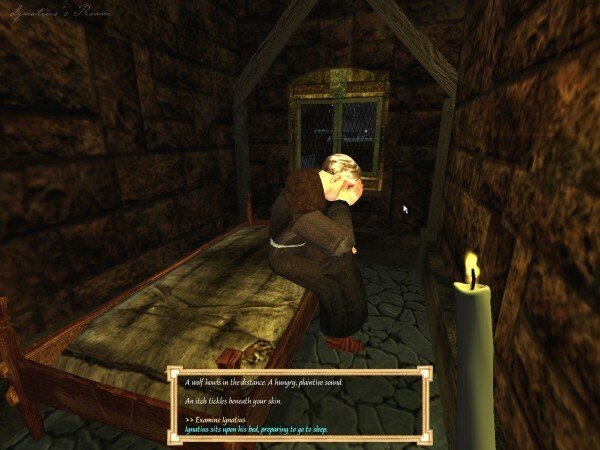 This week’s screenshot shows Ignatius at the beginning of Act 2, now in his bedroom in the dormitory, displaying some of his grief after the incident with Matteo. Ignatius in Act 2, troubled after the incident with Matteo. Only a few items to discuss this week. The new hare object for Act 2 needed a slight adjustment, so NR took care of that, and the final hare object was loaded in. We began the process of fixing one of Constantin’s idle animations for Act 2, as well as starting on a few new ones for both Constantin and Ignatius. Also, with the last devil arm completed for the prayer spell, I got those items exported and inserted into the main working directory, and started on the code to put everything together. Finally, I discovered something new an unexpected from the Torque scripting language that I never realized all this time: the random number function getRandom(), when passed a single number X as an argument, returns a random number between 0 and X. My previous experiences with languages has always been that a function like that returns a random number between 0 and (X-1). Fortunately, this didn’t create too many issues as I typically accounted for values out of the expected range, but it did make for some slightly puzzling behaviors that I now understand. This week’s screenshot shows the final hare object in position in Act 2 in Constantin’s room, with Constantin preparing for bed in the background. Constantin preparing for bed, with the new hare in the foreground. Now with weekly screenshots! See below. This past week was a little slow as we got back in the swing of things, but we still accomplished some good things. We got a new model for the skinned hare to use for Act 2 and beyond, which is now implemented and functional, and NR completed the work on the final Satan arm and zodiacs for the devil prayer. The zodiacs are installed and working, and now I just need to export the final arm and get all of the arms positioned and timed appropriately. So I’ll probably be spending some time this week working on that prayer. I also finally found and fixed a long-standing bug that affected the inventory screen, whereby an object selected in the inventory would not become de-selected when clicking on a non-inventory item (or on nothing). This week’s screenshot features the opening scene from Act 2, with Drogo standing excitedly over the dead body, rubbing his hands together. The opening scene from Act 2. Can you feel the excitement?